How do children learn language? Many linguists believe that the stages that a child goes through when learning language mirror the stages of language development in primate evolution. In a paper published in the Proceedings of the National Academy of Sciences, Charles Yang of the University of Pennsylvania suggests that if this is true, then small children and non-human primates would use language the same way. He then uses statistical analysis to prove that this is not the case. The language of small children uses grammar, while language in non-human primates relies on imitation. Yang examines two hypotheses about language development in children. One of these says that children learn how to put words together by imitating the word combinations of adults. The other states that children learn to combine words by following grammatical rules. Linguists who support the idea that children are parroting refer to the fact that children appear to combine the same words in the same ways. For example, an English speaker can put either the determiner "a" or the determiner "the" in front of a singular noun. "A door" and "the door" are both grammatically correct, as are "a cat" and "the cat." However, with most singular nouns, children tend to use either "a" or "the" but not both. This suggests that children are mimicking strings of words without understanding grammatical rules about how to combine the words. Yang, however, points out that the lack of diversity in children's word combinations could reflect the way that adults use language. Adults are more likely to use "a" with some words and "the" with others. "The bathroom" is more common than "a bathroom." "A bath" is more common than "the bath." To test this conjecture, Yang analyzed language samples of young children who had just begun making two-word combinations. He calculated the number of different noun-determiner combinations someone would make if they were combining nouns and determiners independently, and found that the diversity of the children's language matched this profile. He also found that the children's word combinations were much more diverse than they would be if they were simply imitating word strings. Yang also studied language diversity in Nim Chimpsky, a chimpanzee who knows American Sign Language. Nim's word combinations are much less diverse than would be expected if he were combining words independently. This indicates that he is probably mimicking, rather than using grammar. This difference in language use indicates that human children do not acquire language in the same way that non-human primates do. 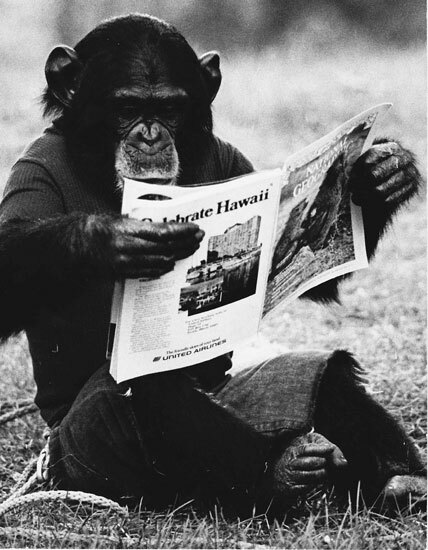 Young children learn rules of grammar very quickly, while a chimpanzee who has spent many years learning language continues to imitate rather than combine words based on grammatical rules.